I saw an interview recently with Professor Graeme Clark, the inventor of the Bionic Ear and watched fascinated as he told the story of the first person implanted and how all data relating to the first hearing experiment was lost. They played single tones into the device at first, and then a tune which was well known at the time. Sadly, it was "The" National Anthem and as soon as the patient, who had lost his hearing some years before, heard it, on reflex stood to attention, accidentally unplugging all the data leads on the way up. Of course "The National Anthem of Australia" in those days, wasn't the the song about Girt that we all know so well, rather it was the cheery "God Save our Gracious Queen", and it is a testimony to our commitment to put Commonwealth before country that it was taken as seriously as it was. No public function of any kind was ever commenced without a stirring rendition of the thing played by a brass band, a recording of the Queen's guard playing it, or perhaps the Humpybong Municipal Band at a pinch. Our morning parade at school featured a recording so scratched that we were blissfully unaware that the out of time clicks that occurred just before the second lot of "dadada dum dum dum dum de-dums" weren't actually part of the music. It is with just a touch of embarrassment that I recall the last time I stood for that particular version of our national anthem at a public event. I can't remember the name of the Cinema, but it was in George Street near McDonnel and Easts and the movie was "It's a Mad Mad Mad Mad World" which means it happened some time around 1964. We all waited silently for the show to begin as the lights slowly began to dim. The projector began to roll and the image of the bearskin hat of one Her Majesty's finest could clearly be seen projected on the red velvet curtain as it began to sway. As the curtain was drawn, the drums began to roll, and the audience dutifully stood to attention. This is where things went slightly awry. 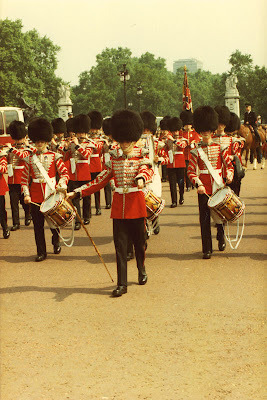 Instead of rolling into the well known anthem (minus clicks), the band played another marching tune as the camera panned to a platoon of Guards drilling in front of the palace. A few more beats and it became clear. This was an advertisement for Grenadier Cigarettes! Some shrunk back into their seats hoping no-one would recognise them in the darkness. A snigger rippled through the theatre, but no one spoke. Grenadier Cigarettes disappeared shortly afterwards along with cigarette advertising, and I haven't seen the national anthem played in a cinema since, but if it were to happen, perhaps I will be forgiven if I'm a little slow getting to my feet. No singing for old mate Charlie when he takes over?